"Alexander Blain Sr. and Alexander Blain, M.D. F.A.C.S." 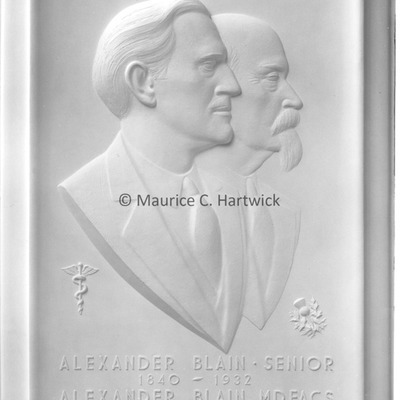 "Alexander Blain Senior and Alexander Blain, M.D., F.A.C.S." minted in bronze, rectangular plaquette. Inscription of face reads "Alexander Blain Senior 1840-1932 Alexander Blain M.D. F.A.C.S. 1885-1958," with bas-relief portraits of father and son. Located at Blain Hospital, Detroit, Michigan (full-scale relief, bronze).